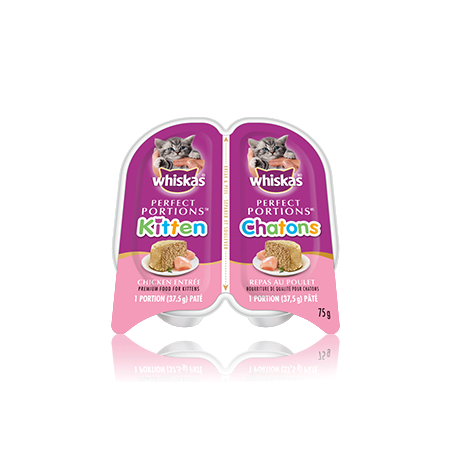 WHISKAS ® PERFECT PORTIONS™ Kitten Chicken Pate Entrée is rated 3.3 out of 5 by 3. Rated 1 out of 5 by Kyara from OMG seriously? You ONLY have the "perfect portions" for kittens???? This stuff is unnecessarily overly priced! I can make my OWN portions thank you very much! Make regular cans!! Rated 5 out of 5 by Smithy from WOW!!! My 3 cats have been eating another brand for years. A few weeks ago I decided to try the perfect portions. They LOVE it, and no wasted food. Can't believe it!! Rated 4 out of 5 by Terry from Picky Kitten The new kitten was picky at first, but he loves the Kitten Perfect Portions Chicken...just bought 15 of them at my local Wal-Mart. Love the price! WHISKAS® PERFECT PORTIONS™ Pate Kitten Chicken Entrée is formulated to meet the nutritional levels established by the AAFCO Cat Food Nutrient Profiles for growth. Feed Kittens 4 to 6 servings based on age and body weight daily. Adjust to maintain ideal body condition.